The Mighty Waratahs were clinical on Saturday following up a comprehensive 5/5 weekend against North Sydney. Coming up against a much stronger club in Easts this week, we needed to continue to step up, both as teams and individuals. The weekend was filled with some fantastic individual performances which sees us in a commanding position in all 5 matches. First Grade toiled hard all day against a quality bowling attack, with James Crosthwaite compiling a patient 103 and Nappa contributing nicely with 102. These two showcased their class against one of the best attacks in the competition, in trying conditions. Well done boys. Second Grade were led well by a briliant opening stand and some handy middle order contributions on what was a tricky batting wicket. After being sent in on a pace friendly deck, Cubby’s men had another good week with the bat, posting 300 + for the second time in a row. Rawlings (45), Weston (86), and Davies (61) were the standouts. Second Grade had 16 overs at the end of the day and have Easts 2/35 with Foster taking both wickets. Third Grade had a solid day out with the bat as well, posting 260 at the end of the days play. Jordan Daly was the standout with a classy 102, well supported by Darcy (50), Hole (45) and Badyari 40*. Fourth Grade enjoyed a fresh new wicket down at atmosphere park. Brad Wilson terrorised Easts top order finishing with an impressive 5/20. The boys wrapped up first innings points and are 9/136 in response to Easts 64. O’Sullivan and Bain both notched 30’s to steer the boys to a 52 run lead at the end of the days play. Our fifth grade side had a tough day out with the bat, however managed to crawl to 160 thanks to valuable contributions from Mendel (36), Trewartha (35), and Wheeler (27). Ben Falconer and Michael Counsell were exceptional with the ball and both picked up two scalps each to have Easts in a spot of bother at 4/39. Sunday’s 20/20 fixture saw Manly host two matches vs Gordon and Mosman. Unfortunately the Tah’s had a day to forget with both oppositions posting scores well over 200 which made for some tough chasing. Credit to the batting unit who still managed to score 190 in each match respectively, but unfortunately it wasn’t enough in the end. This also brings a close to our 20/20 competition aspirations, however we are still in a great position currently to take out the other two titles and we are sure the boys will bounce back. With plenty of brilliant individual performances over the weekend, it was tough to decide any one performance over another. From James Crosthwaite’s 103, to Brad Wilson’s 5/20, and Daly’s 102, it made for a tough selection. 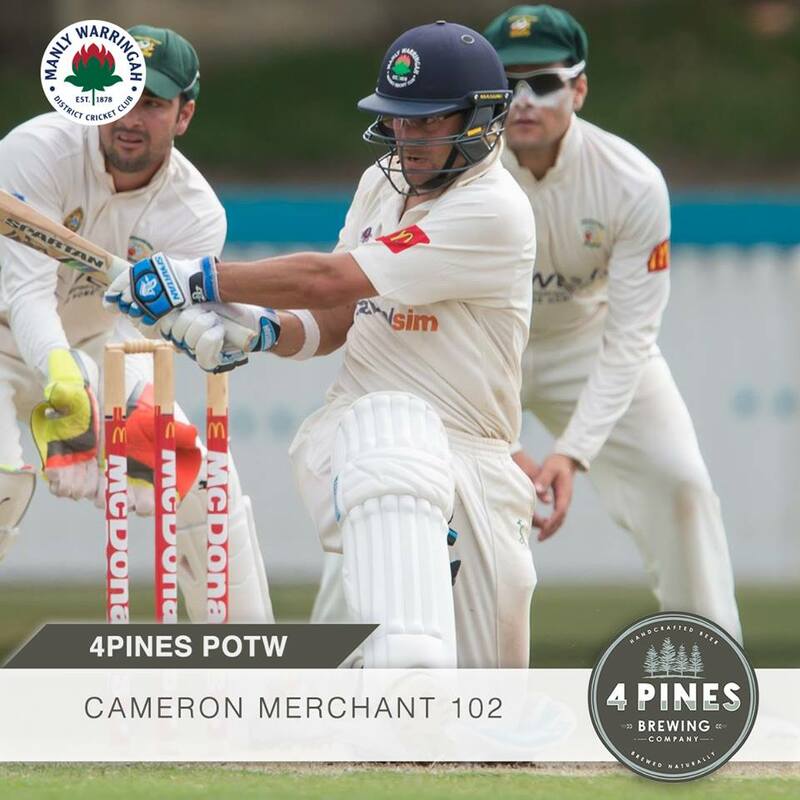 We have chosen Cameron Merchant as our 4 Pines Player of the Week. Nappa enjoyed his return to the top grade with arguably the best of his 12 first grade hundreds. Coming to the crease with the Tah’s in a spot of bother, Nappa batted beautifully with the lower order to complement James Crosthwaite’s century and compile one of his own. This showcased Nappa’s class once again and his efforts along with James’ now have first grade in a competitive position. A beautiful Waverley Oval awaited a top of the table clash between two of the more dominant teams during the start of the 2017/18 season. Eastern Surburbs boasting the experienced duo of NSW bowlers Harry Conway and Will Somerville lost the toss and were put in the field. A rough start for the Tahs saw Beadle, A Crosthwaite and Lenton all dismissed with the score yet to reach double figures. A critical, steadying partnership from J Crosthwaite and new skipper Green settled the flow of wickets and took us to lunch. Green unluckily given out and Jack Edwards out early had the Tahs reeling at 5/100. Merchant and J Crosthwaite again built a crucial partnership that saw James go to tea 99 no. James reached a fantastic, patient 100 shortly after tea before been dismissed for 103. It was up to Merchant and the tail to wag to revive a respectable score for the Tahs and that’s exactly what he did. Playing his natural way Cameron with outstanding support from Taylor Beatty (28) compiled a century for the history books, his 12th first grade 100 and one of his more prolific innings. Eventually all out for a hard fought 284 allowed the Tahs one over at the Easts boys. Play will resume next week Easts 0/6. The real character of the Manly Warringah Cricket Club was on display today. he Manly Mortons turned up to a picturesque manly oval looking to carry forward our momentum from last weeks towelling of North Sydney. We were greeted by a green soft wicket which had a few boys raising eyebrows. Cubby was of the opinion that we should bat first dig in and reap the rewards on a flat wicket in the afternoon. The toss was duly won and Ralphy and Logan headed out to open the innings. It was tough work early on for the boys, but the easts attack struggled to put 6 balls in a good area and runs flowed aplenty. The boys put on 100 for the opening partnership which was a great effort in the conditions. Ralph was first to go for a superb 45 and once again looked set for a big one, only a superb delivery that jagged back and pinned him could end his hard working display. Cubby and Logan brought the boys into lunch at 1-130 well and truly our session. The Mortons headed out after lunch looking to push forward on what was now a quick bouncy track. Cubby was soon adjudged lbw maybe slightly unluckily to end a patient innings. Ollie joined Logan and runs flowed, Logan moved quickly to 86 before holing out to deep square pulling a ball a metre above his head. Ollie and Baz looked busy before Baz was undone by a pacey yorker. Ollie batted superbly for a polished 61 and looks in ominous form this year! The rest of the order was a combination of starts and early dismissals as a few of the easts turned in some quick fiery spells! With TK the stand out with 40 at number 7. Ruggie Carden managed to push us over 300 despite a receding hairline and we were all out for 302, twice in two games we’ve passed 300 after a few poor days with the bat early season. A huge positive for us. The Mortons were left with 16 overs at easts. Joel Foster and ruggie opened up and both bowled with pace and guile, it was fozzie’s best spell so far this year as he was too good for 2 of the easts batsmen one lbw and one caught by ruggie at gully. Easts finished the day 2-35 needing 270 odd more on a difficult deck. If we turn up and bowl well next week we’re a big chance of taking home the 6 points to get our season back on track! he skipper Javi won the toss and elected to bat on what looked a sensational cricket wicket. Openers Billy D’Arcy and Sam Hole got the team off to a terrific start, scoring freely to take the total to 91 before Billy ran himself out, shortly after bringing up his half century. A few overs later Sam Hole fell to a waist-high full toss, for a well made 46. This brought Jordan Daly to the crease,who suddenly found himself in a tricky position, oosing partners in quick secession, to see the visitors in trouble at 5-130. Captain Badyari joined Daly at the crease and the two went about resurrecting the innings. Jordan batted brilliantly, mixing power and finesse, while scoring to all parts of the ground. He looked in complete control, scoring a chance less century (102). His Captain at the other end played a massive role in the 130 run 6th wicket stand. Javi rotated the strike regularly and punished the loose ball to finish 40no at the end of the days play. The Manly side finished at 6/260 at stumps, leaving the skipper Badyari with an option to try to add some quick runs next week. The bowlers will need to be patient and bowl well on what was a good wicket for batting. The mighty fourth grade boys turned up to a picturesque Grahams Reserve looking to build on the momentum gained from the last round. After we peeled back the covers and saw the green, rock hard wicket captain Gumms was backing the batters to put on a big total on day one but ‘unfortunately’ lost the toss and the Easts skipper decided to bat. Wilson and Archer opened up strongly with Archer getting a wicket in the first ball of the second over bowling the opener with an absolute peach – welcome champ. This opened the floodgates with the ball doing absolutely anything and everything, proving that it was a great toss to lose for the Manly boys. Wilson bowled with fantastic line and length and had the ball on an absolute string destroying the pegs for fun in what could only be described as a complete procession of wickets whilst Archer built pressure up the other end. Drinks came around with the Tahs in a strong position with Easts reeling at 5-26, Wilson with 4 huge poles. After drinks Bain and Graham continued the good work with the ball, taking wickets steadily with Bain taking 2 and Graham taking 1. Wilson was then brought back on to finish with a well-deserved 5-20 and Alexander took the final wicket to dismiss Easts for 64. With 45 odd overs left in the day and the wicket still doing plenty, the boys were focused on the task of knocking off the creepy total and getting first innings points in the bag. Openers Gummer and Cohen started cautiously before Cohen was out in the 8th over. Gummer and Brewster made 19 and 16 respectively but the Easts bowlers managed a few quick wickets to have the boys in a bit of trouble at 5-50. We managed to creep our way to 65 for the loss of 6 wickets before some late hitting in O’Sullivan (38) and Bain (38) at the end of the day put on a crucial 49 run partnership for the 8th wicket, extending the lead to 72 at stumps. With first innings points in the bag the lads will be sure to put in another strong performance next week for the outright victory. Special thanks to Wrighty and Joel Wood for all their help on the day, cheers guys much appreciated. T he mighty 5s arrived at Snape Park with good spirits coming of there last 2 victories. The pitch had a nice coverage of grass which might have suggest the bowlers will get a bit out of it early. Geoff won the toss and the boys were in for a stick. The openers, Dom and Brynn, looked in good touch continuing their good form from the previous round. They negotiated the first hour of play as the boys were 0-48 at drinks. Dom was the first to go, for 27, with the score 1-69. Unfortunately the tahs then lost 2 more wickets cheaply. With Jack and Geoff the 2. Zach was with Brynn and new they had to make tea. Brynn was out 15 minutes before tea for a well worked 36. The boys went to tea 4-101. Aiden was then dismissed just after tea. Zach and Luca stuck around for a bit until Zach was caught for 35. The score was 5-145. After that the boys collapsed losing 5-13to be all out for 158. There was a tricky 20 over period in which the boys knew they had to take a few wickets. And that’s what we did. Michael picking one up in his first over to start the tahs with a buzz. He then took another and his opening partner, Ben, took 2 more at the other end. Easts were 4-16 off 10 overs. The boys were unlucky to take anymore wickets, even with the help from terrible batting. We will look to push hard early next week with a potential outright win on the cards. I t was a mighty fine day on Sunday that greeted the Tahs for the 1st round of the T20 Cup, both Manly Oval and the blue sky putting on a spectacular day. Confidence was high going into the game with an experienced side and plenty of talent. Skipper Green lost the toss and predictably we were sent into bat. Green opened up with the first over but was quickly deposited to the 40 metre leg-side boundary, and 13 was hit off the first over. Unfortunately that was the best over of the first 8 as Gordon spanked us to all parts of the ground. At 0-110 off the first 8 overs, 250 was on the cards. We managed to pull the Stags back a little, but the start was too big….. 227 from the 20 overs. Ultimately just to many balls in the slot. The Tahs got off to the worst possible start with the bat, losing Lenton for 2, Green for a duck and Beadle 2 balls later for a duck of his own. The game was effectively lost then and there. Some good middle order hitting from Jack Edwards, Adam Crosthwaite, Cameron Merchant, and especially Ryan Farrell put some respectability on the board, but it wasn’t enough to make up and we finished 45 runs short. G Game 2 was against our old foes the Mosman Whales and after some intense previous battles, everyone was looking forward to a tough match. Green lost the toss again and we were again fielding. Unfortunately our bowlers didn’t head the lessons of the first game and we were quickly deposited to all parts of the ground. No bowlers were spared with Green taking 1 for 30 off his 4 probably the best of the bowlers. Chasing 217 was again going to a big task but we got off to a better start, putting on 35 in the first 3 overs before losing Lenton. Again we had a bit of a collapse and at 3/47 off 6 overs we were up against it. However as he has done so often, Adam Crosthwaite got the Tahs back into the contest, hitting a whirlwind 68 off 47 balls, including hitting one into the Room at the Top above the change rooms. Even though it was a small boundary, it was still an amazing hit. Adam had some good support from Beadle but ultimately the task was too great and we went down by 26 runs. A disappointing start to the T20 season but the boys will be back for rounds 3 and 4.